Family stories allow school communities to connect with families in ways they had not thought possible – with those who have come before, those who are here, and those who are yet to be. We all have family stories. Some long, some short; some happy, some sad; some full of struggle, some full of success; some outrageously unbelievable and some extraordinarily funny. What better way to connect with families than to share a story or two? Last weekend, I went to a family gathering. I listened (again) to stories of my grandparents who grew up without transportation, communication, and the immediacy that characterizes today’s generation. Rituals and events that characterized my childhood – card games, family dinners, sleepovers, fishing expeditions, and road trips – flooded my memory. Last night, I began to tell my grandchildren stories of the past – of their grandparents and their parents. I want them to know where they have come from. I want their family stories to be part of their identity. I want them to see that they are not so very different and that we all have moments of happiness, sadness, silliness, and struggle. I wonder whether there is room to share these stories at school, and I wonder how they can help my children and grandchildren find their way in the world. How do stories allow us to explore, problem solve, and become the very best that we can be? How do stories help us to understand ourselves, our student, our families, and our school communities? How do stories support students, families, and schools as we explore right and wrong and discover our sense of place in the world? I follow a simple set of guidelines when sharing stories with families and encouraging them to share theirs. Each is described below, some with a quick story that serves as an example. Find your story. What you are willing to share? What are you not willing to share? Why share your story? Sharing our stories allows families to know us on a different level; it demonstrates willingness to show up and be seen as more than a professional educator. For some, the willingness to share story demonstrates risk and vulnerability that in turn, opens the doors to trust. Perhaps most importantly, sometimes families need to hear our stories before they recognize the value in their own. Be authentic. Never ask families to do something you are not willing to do yourself. Begin with an outrageous story, one that children just can’t help but share. The story (such as the following) often travels home, and children will then return to school, bursting to tell a story about their family; then one by one, they all try to outdo the stories, and we come to know just a little more about how we are similar and how we are different. Special Forks is a story that grows each time it is told; in fact, it is a lived story with a 25 year legacy. Here, I will keep it to the version I first shared with my Grade 1 students. For as long as I can remember, we had a special fork. My mother, in her wisdom, engraved the family name on the back of a single fork. She was brilliant. There were rules about the special fork. You could not flip the forks already on the table to see where it was, you could not steal it, and you could definitely not switch places when you discovered that you did not have the special fork. The only one who knew the location of the special fork was the one who set the table. As I said, “Brilliant.” There were mad dashes to set the table, because your food always tasted better with the special fork. Fast forward many many years when my parents decided to purchase new flatware, seemingly unaware of the value of the special fork. I, as the oldest, inherited the old flatware for my camping gear, and coincidentally and fortuitously, the special fork. I’m not even sure I knew I had it, but one infamous weekend in the heart of Arrowhead Provincial Park, my brother found it and in outrage (in front of his kids) lost it, crying, “You get everything. I cannot believe that mom gave you the special fork!” He sulked all weekend long, but had the last laugh as he left the campground on Sunday, special fork in hand, hand waving madly out the window, shouting back, “I’ve got the special fork.” Very promptly the next day, I had him served with a subpoena to return the silver special fork that he had stolen from me. The return letter from his lawyer dictated that he was not in possession of a silver fork with the family name on the back; he had a gold one. I must be mistaken. 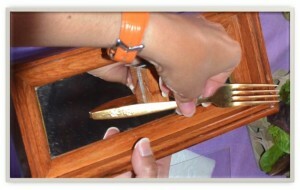 (Unbeknownst to me, he had managed in 24 hours to have the fork gold-plated). For many years since, this fork has been lost, stolen, and found in our now four-generation family – always when you least expect it, and sometimes when you need it most. It now resides somewhere, in a solid oak case, with a mirrored backdrop displaying the family name. I’m not quite sure where it is today, but what I do know is that the last time it was stolen, it was from my mom who was just about to eat her ceremonial 50th anniversary meal! Help families to tell stories with purpose. Use stories as a concrete way to solve problems or find alternate solutions. There doesn’t always have to be a moral, but sometimes there is a lesson to be learned. This requires that we know how to frame our stories and can tell without preaching or always giving a ‘concrete’ moral to the story. And we certainly have to share our stories with humility and as close to truth as we can recall comfortably. We can paint a picture, offer a path, show a journey, but families must know that they cannot expect that children are always going to “learn from our mistakes.” If only parenting could possibly be that easy! We all have siblings and we’ve all done things we’re not proud of. Some of these come out years later as we sit around the dinner table telling tales our parents never knew, inevitably ending with, “Here and we thought you were such great kids!” One such story is that of my mother’s new lamp. We were not allowed to be in the living room, and we were definitely not allowed to play hide and seek in the living room. But we did. And my mother’s brand new lamp fell off the table, miraculously enduring a very clean break. We (my brothers and I) stood over the lamp pondering the very weight, “Well, we’re in for it. What are we going to do?” We decided, knowing what we knew (that our mother dusted every day), that we would carefully piece the lamp together such that it looked like new. And in fact, it did, until the next day when my mother moved the lamp to dust, and it fell into its two pieces. Imagine her shock! Imagine our shock when she superglued it back together and never made mention of it, until of course some 25 years later when we finally told the story… I guess it was mom who had the last laugh and taught a very powerful lesson. There’s just no use crying over spilled milk! Speak their language, learn their customs, gain legitimate and respectful entry into the world of family storytelling. As an academic, a mother, a grandmother, and now a family engagement researcher, I have become increasingly comfortable sharing stories of struggle and success, certainty and doubt, celebration and frustration in a way that says, “I’ve been there, I’ve done that, I’ve felt the same way, and I’m still here to tell the tale.” First School Days has served me well as both an icebreaker and an immediate conversation starter that allows me to connect to the successes, worries, and struggles expressed by many families. Support families as they explore and discover their stories. Suspend judgment. Listen to families as they explore and articulate the events and stories of their lives; sometimes this happens spontaneously at a parent-teacher interview or even at the school door. Let them talk, problem—solve, find solutions, and shape the stories they want to share and tell about their families. Make suggestions that respond to their identified needs and struggles. Lucy’s Lullaby tells the story of a family struggling to find a way into their daughter’s literacy. I tell it now to show that families are often doing all the right things; they just need the validation of school to make it right in their minds. Lucy, at five years old, was a little like Leo Lionni’s Frederick, content to do things her own way. When I first met Lucy, her family was struggling to engage their daughter in books. When I asked what she liked, they responded in unison, “Lullabies!” All she wanted were the lullabies that they would sing, lullabies that told silly stories about her life or about the life of their family. What the family was missing was their daughter’s absolute engagement in her own story, in the story of her family. Capitalizing on her giftedness as a budding artist and the family’s love of lullabies, they created their own books that told of her search for identity. What’s your story? What are you willing to share with families? Sometimes the more outrageous the story, the more likely you are to motivate families to share theirs. . . my favourite response to a story was from a parent who said, “Your family is outrageous. 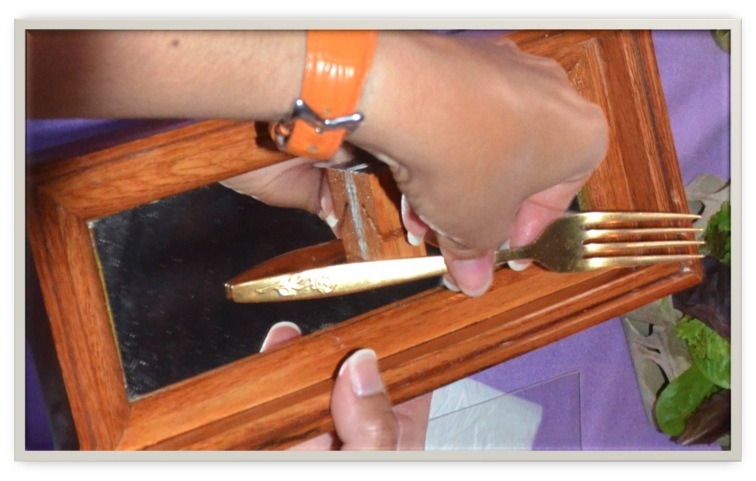 Is this really a true story?” I took a picture of the special fork and sent it home. Yes, it really is true. And guess what? As of Thanksgiving weekend, the fork is once again in my possession! I enjoy your stories and your style of writing. They continue to lead me to reflect on other stories that, for the moment, remain untold but that are part of our family fabric.